TMSRemote is a TAP that allows you to remotely control the PVR over a network. The TAP comes with a PC client (Windows) that shows the current menu view and a remote control that you can use to interact with the PVR. There is also an android client available (iTMSRemote). The iOS iTMSRemote client is no longer available. 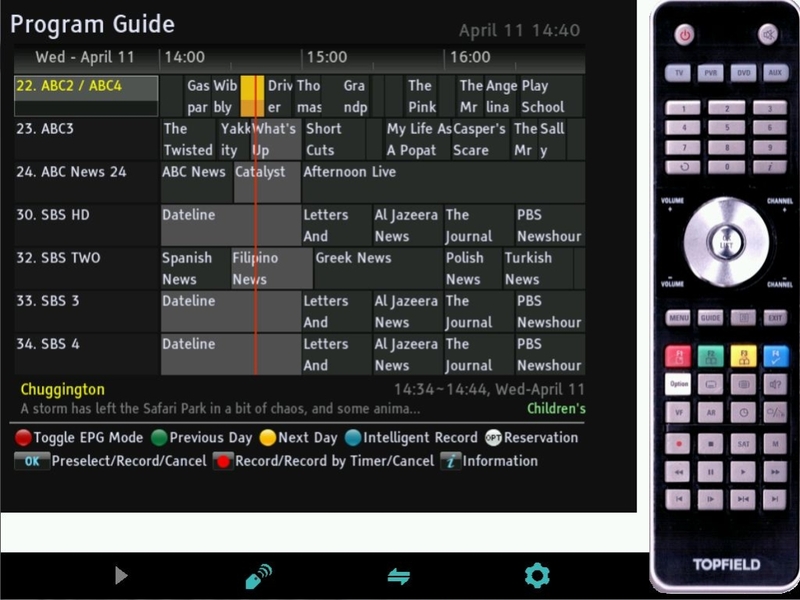 Download the TMSRemote TAP via TAPtoDate or here. Here is a picture of the PC Client showing what's on the screen (only the OSD is ever shown, not video). 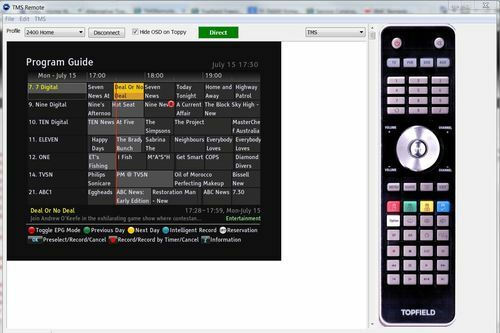 Using TMSRemote when the TV Portal (April 2013 firmware) is active can result in the Toppy freezing. The process for installing and configuring TMS remote is discussed here. If the 'Hide OSD on Toppy' box has a tick in it, then the on-screen display not displayed on the TV connected to the Toppy. This can be useful if you are messing around with the system while somebody else is watching a program, however beware that the remote control keys are still active and will apply to whatever screen you currently have open. So, if you are connected from another room, you might want to take the remote with you. When a key on the physical remote control is pressed then the OSD appears on the TV, but if it is changed by an action from the TMSRemote program then it disappears from the TV. Clicking on this toggles between dark green and bright green backgrounds. a bright green background means only the remote button icons can be used. a dark background means that some of the keyboard can also be used in addition to the remote button icons. TMSServer and TMSClient are a pair of TAPs designed to allow multiple Topfield PVRs to communicate with each other and share recordings and other media.